Welcome to Everything Executive Functioning! This should have everything you need for your child’s Executive Functioning issues and their IEP. 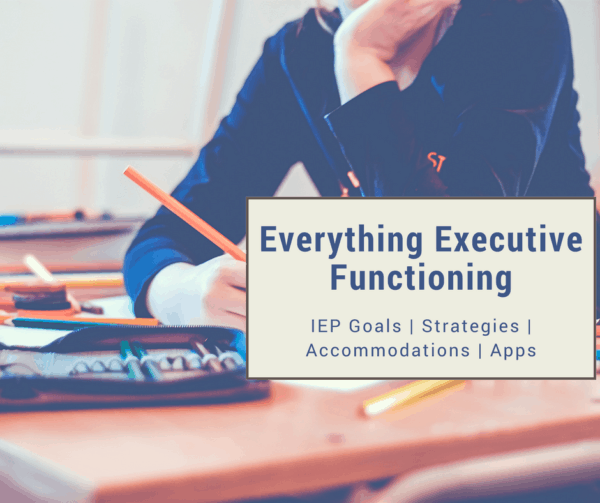 In here you will find Executive Functioning IEP Goals, IEP accommodations, apps that address Executive Functioning deficits and strategies for including EF in your IEP. Grab a cup of tea and stay a while! Remember when we were in elementary school, and there was always that “one kid” who was just constantly messy? His papers were always getting lost, the desk was a mess, the backpack was a mess-the whole bit. Now, as an adult, I feel terrible for not understanding that those kids really struggled with Executive Functioning issues and no one cared. They just got yelled at all the time. This is another giant post redo. I realize in our Facebook group that I end up posting 5 or 6 links to answer a parent’s question about Executive Functioning. So, yes, I did. I combined all those posts into one post. If a child lacks the ability to do any of the following, you should ask that they are evaluated for Executive Function Disorder. Directly from Wikipedia: Executive function is an umbrella term for cognitive processes such as planning, working memory, attention, problem solving, verbal reasoning, inhibition, mental flexibility, multi-tasking, initiation, and monitoring of actions. Executive functioning describes a set of mental processes that helps people to connect past experience with present action. Learn how executive function governs your child’s ability to manage time, make plans, and keep track of more than one thing at once. Keep in mind, that while this is a buzzword, it is not, and should not, be considered a fad. There’s a difference, right? Hopefully, this becomes a part of the regular planning and goal setting in the IEP process. More importantly, what does it look like? It’s the ability to set an alarm clock and be able to get up with that alarm and plan your morning accordingly to be on time. It’s not just about being late, it’s about having anxiety so severe that the person is ready to go three hours ahead of time, sitting around waiting and worrying about being late. It’s about being able to plan out how long a project will take–a homework project, a craft project and being able to stop halfway through, and then come back to it, know where you were in the project and finish it. It’s about being able to judge mid-way through that project–that it’s not going to work, so you have to make changes, change your mind, and re-plan what you were going to do. It’s about not just doing the homework, but being able to track it and hand it in on time without being reminded. It’s about being able to line things up sequentially in your mind. It’s about looking at a phone number in a phone book and being able to memorize it long enough to dial it. It can be about impulse control and knowing what is appropriate to say in public. It’s about reading group dynamics and social cues. It’s about being able to cook eggs, bacon, and toast-all at the same time. Executive Functioning Skills are essential to life. If you told your teen that you were going to go to the beach for 3 days, and to go pack a suitcase, can they do it? Do they have problems planning out and doing homework, and turning it in on time? Do others dislike them because they don’t know when to stop, as far as jokes and things like that? Is their behavior irritating to others? Schools have a tendency to overlook these skills and focus on academics. And as parents, we are enablers in order to survive–we set the alarms, we wake them, we drive them, we hold their hands in public and interrupt them when we know they’re going to say something inappropriate. But we can’t be there forever, they need executive functioning skills to be independent. Assess your child’s EF skills all through their academic career, but it becomes particularly important at age 14. 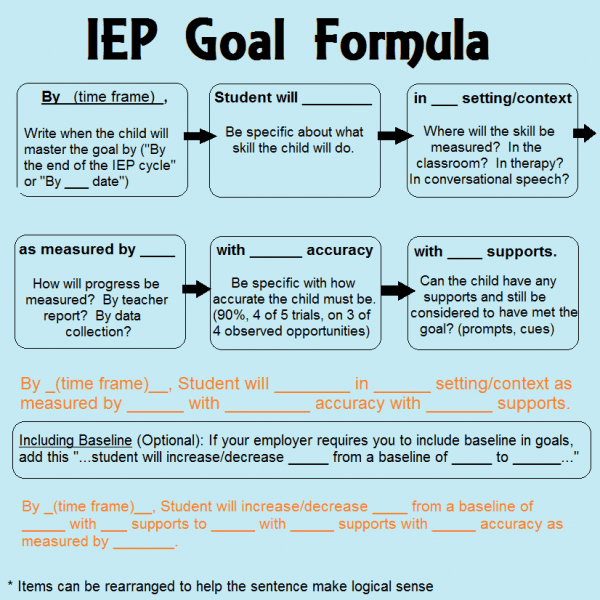 Then you must get those goals listed on the IEP. 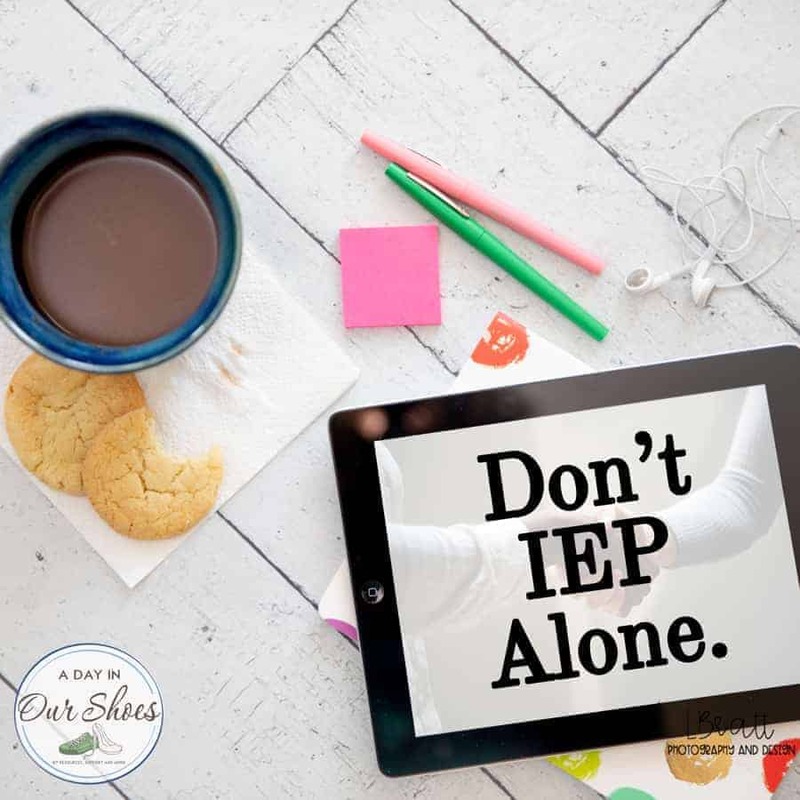 If the goals aren’t on the IEP, and your child is faring well academically……..you don’t have a case for a 13th or 14th year of school to work on them. Get them on the IEP now. As typical people, we take these skills for granted–but when they are absent, you notice. Ask for an eval or an IEE and find a qualified evaluator in your area. These are essential survival skills for independence. Does your child initiate tasks, or have to be told to do everything? Do they have inhibition (speech/behavior) and impulse control? Can they organize future tasks? Can they organize their own materials? Do they have a working memory? Since Executive Functioning is so broad, here are some questions for parents and teachers to talk about, to determine what needs to be worked on. One phrase that is often used is: Goal, Plan, Predict, Do, Review. So together someone works with the student to discuss the goal, plan what needs to be done, predict what could go wrong or what supplies/time you’ll need, do the goal and then review the work. What tasks does your child need help with at home? Does your child lose things? How often do you need to explain how to do a task? Does your child have trouble concentrating? Can your child plan ahead for activities? Does your child get upset with change? Does the student get distracted easily? Does the student have an organized backpack or locker? Can the child fix their own mistakes? Is the child aware of the consequences of their words or actions? Does the student demonstrate incomplete or careless work? Can the student develop plans and strategies? I have organized the IEP Executive Functioning goals by the area that they target. Any goal can be taken from a general phrase to measurable by adding parameters. To do this, you need to know the baselines. In other words–how often is this student doing this skill now? How many times per day or week? How many teacher check-ins or verbal prompts is it taking to get this done? Know what the numbers are now, and choose a reasonable, measurable number for them to achieve. You can’t measure progress without baselines. First, I found these two executive functioning IEP goals online and the suggested monitoring process was the various parts of the WISC. I know that education is becoming very data-driven, but I do have concerns about a student being able to do the skills for a test, but not being able to apply it across all environments. Still, here are the goal suggestions. The student will develop the ability to attend to individual tasks and will improve processing speed through the use of timers and cuing utilized with the entire class in the general classroom. Student will successfully complete 12 or more weeks of a proven cognitive enhancement program that addresses deficits in processing speed, short-term working memory, attention to detail, monitoring, sequencing and organization skills, with instruction, for at least 1 hour per day every week day, to alleviate affects of executive functioning disorder deficits. Given a specific routine for monitoring task success, such as Goal-Plan-Do-Check, the student will accurately identify tasks that are easy/difficult for him. Given a difficult task, the student will indicate that it is difficult. Student will explain why some tasks are easy/difficult for him, help develop management strategies. If tasks are difficult, Student will request help. When he is more capable than the other child, Student will offer help to others. If a student has negative behaviors, debriefing session held at an appropriate time and place and student is able to identify his triggers and possible strategies. Using learned strategies and given fading adult support, the student will prepare an organized outline before proceeding with writing projects. ~how many problems he will be able to complete in a specific time period; etc. Given a specific work checking routine, the student will identify errors in his work without teacher assistance. student’s rating of his performance on a 10-point scale will be within one point of the teacher’s rating. Given training and practice with the concept of compromise, and in the presence of visual supports, the student will accept and generate compromise solutions to conflicts when working cooperatively with others. difficulty retaining information while doing something with it; e.g., remembering a phone number while dialing. A few models of classroom-based EF strategy instruction are available, including the Kansas intervention model, Benchmark model, and Drive to Thrive, according to Meltzer in her book, Executive Function in Education (above). • Strategy instruction should be directly linked to the curriculum. • The strategies should be taught explicitly, including teacher modeling and extensive practice. • Strategies should be taught in a structured, systematic way. • Strategy instruction should address students’ motivation and effort. Tools like iPads, watches with timers, and laptops. Use and prepare visual schedules, review several times a day. Ask for large print, written directions with oral instructions whenever possible. When shifts in schedules and activities, plan for transitions. Create “to do” lists/checklists with estimated times. Devices such as a hand-held for reminders on projects, assignments, meetings such as iTouch, Blackberry, iPhone, etc. Large, easy-to-read, erasable color-coded calendar for projects, long-term assignments, meetings, events, activities, chores, etc. Ask for extra textbooks for home use-keep in work areas. Have separate work areas with complete sets of supplies for different activities/subjects. Schedule a weekly time to clean and organize the workspace. Vocabulary-iPad,iTouch, iPhone, or other handhelds for apps that have vocabulary practice. Whew! I think that covers it all. Good luck! And of course, I cannot talk about EF without mentioning ADHD accommodations. Good luck and consider joining our Facebook group for more assistance.